Recently bought an SS for this season and so far i'm loving it. I'm using eggbeaters which I've always used for pedal when racing and never had any issues. I have noticed that when climbing on my SS my feet will sometimes disconnect from the pedal. I have also noticed a large amount of play between the cleat and pedal even when new cleats were installed. The shim is worn out in the front which i'm assuming could be causing the issue. Has anyone else noticed or experienced similar issues w/ Egg beater's? I have a pair of SPD cleats that i'm going to try, has anyone use both and noticed many differences? I like the beater's due to the lighter weight and minimalist design, but it's useless if it doesn't lock my foot down. I think you have to use Shimano SPD. If you have to restart on a one-speed, you need to pop in real quick. If you need to get out because you just couldn't quite make it, you need to pop out REALLY quick. I have personally seen, right in front of my own eyes, several brutal Crank Bros Crashes, two of them being severe and one of them requiring neck surgery. I've been using Crank Bros. for 10 years without an issue. I've rebuilt both my sets and they are working fine. I think they're easier to get into that 2-sided pedals and aren't any harder to get out of than any other pedals. As for SS use, I have them on mine and haven't pulled out of them once accidentally. I do get about one pedal-strike-ejection a year, but that's about it. 1) If you are disconnecting accidentally, either there is a mechanical problem, or your feet are twisting more than usual. If the latter, going for Shimano cleats and pedals might lock your feet straight more - but that might be fighting the natural alignment of your limbs and cause you physical problems. 2) Pulling up hard is not very good for knees. I sometimes do it but it is a last resort for making it up or over something. I'm happily using Time pedals but their function is somewhat similar to CB, allowing "float". With Time, you can adjust opening angle by installing cleats either "correctly" or on the "wrong" shoes. Not sure if CB is similar there. if your cheap like me and hat maintenance you'll probably end up on shimanos. replacing those ridiculously soft brass cleats 2-3x a year on my time pedals (usually after a crash caused by them unclipping accidentally because they were too worn and would start to disengage randomly) eventually lead me to shimanos. i usually just throw on a new pair on when i get new shoes and they are good for the life of the shoe. if you pull out of a shimano pedal your ankle either twisted too far or you have REALLY neglected your cleats... i like no mystery releases so i am sticking with shimano until i see something better. Have you looked at the Crank Bros Tread Contacts? I haven't used them (yet), but they seem like they would help tighten up the play in your cleat. If you have a shim under your cleat, removing it will tighten it up for free. Used Crank Bros. pedals for years, but started to pop out of them the more aggressive I got on the bike, regardless of how new the cleats were. Switched over to Shimano XT's and wish I would have done it years ago. Seem to be more durable (cleats and pedals) and definitely lock your foot in better. Plus, they are bit easier for me to get into for some reason. . . .
Shimanos will take care of your two stated issues completely. 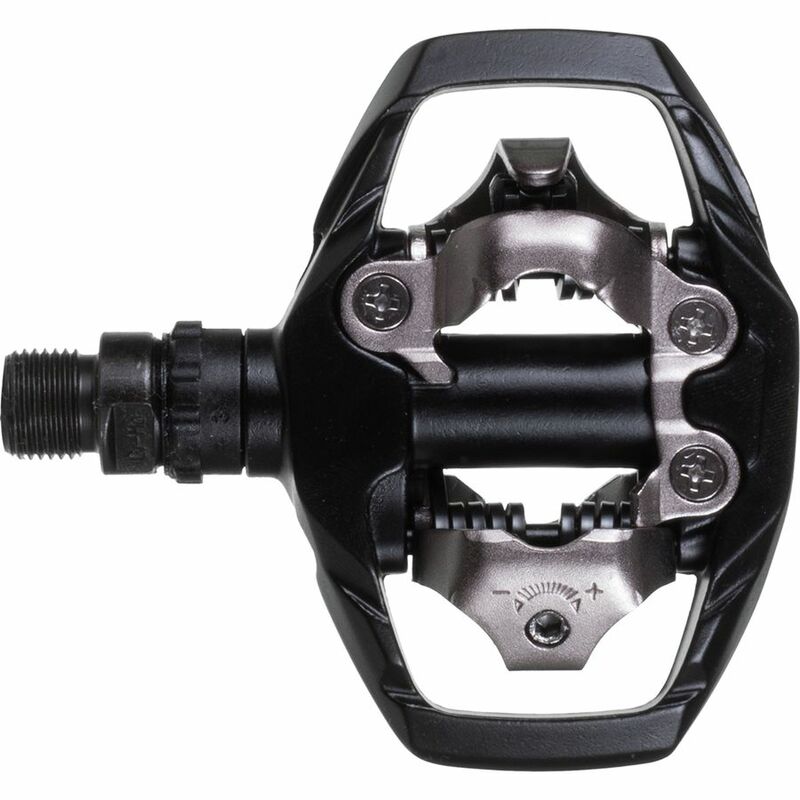 I have used Times for the last 15 years, but recently switched to the new XTR trail pedal, and it is a significantly better pedal. Very easy to get into, no accidental disconnects, and no extra play. Thanks for the input guys. I have swapped the CB cleats with the dot onto the left (harder too unclip) and there was no benefit. I think it's a combo of a slightly worn bottom carbon sole and the force pulling up. I'm not twisting my foot as I said earlier, i've never had an issue w/ these in the past 4 years of racing. I am not pulling straight up but slightly forward and up. Even w/ the shoe clipped in w/out my foot in it you can pull the shoe up and down so the issue isn't your typical float but actual play between the cleat and pedal. I switched to Shimano, and I am happy I did. I love the way Eggbeaters feel, and they are great pedals. Eggbeaters tear into carbon soles, all the way to the female bolt receptacle, up inside shoe. Then you are locked in and cannot easily get out. I had a pretty nasty fall before figuring this out. Metal pedal wing on metal bolt receptacle is dangerous after it wears through carbon soles. After switching to Shimano XT, I notice the all steel system is more durable, and the soles of my shoes do not get damaged anymore. I miss the float of Eggbeaters, but Shimano is safer in my opinion. Eggbeaters are good pedals, depending upon shoe sole, and you could use CB sole protectors, but you still need to pay for new brass cleats pretty often, and that got expensive. I wish I had switched back to XT earlier. I go with Shimano's.....mostly because I have been using them since '94, but realistically because I really like the pedal tension to be almost maxed out tight. What are your experiences with pedals with that extra material around the pedal verus standard SPD design? Last edited by mack_turtle; 06-01-2015 at 05:12 AM. A little more weight, platform, stability and clogability. I use the trail spd's for everyday riding and normal spd's for racing. I like the Trail version pedals (with the cage) better for two reasons: 1) I think they are easier to get back into as they never spin and just line up more quickly and 2) On restarts on really tech terrain, if you don't get in immediately, the platform does make the pedal more usable until you can clip in. Those factors make them worth the weight for me. TREV, one last thing, I wish I could switch back to flat pedals, but it is not going to happen. Everyone I know that gets back to flats is very happy that they made the switch. If you are experiencing a learning curve anyhow, why not flat pedals? Don't be like me and stuck in SPD. I climb a lot, and no issues being clipped in, so flats are out, but they are really appealing. Flats are out of the question due to the amount of hill training and racing I do. The issue isn't a learning curve, i've used EB's for the past 4 years and have no issues. The problem is a worn cleat/guard plate and worn out pedals.